Raspberry glazed cicadas, marinated dehydrated stink bugs, sweet pickled dehydrated grasshoppers, marinated dehydrated June bugs and mealworms in the middle. 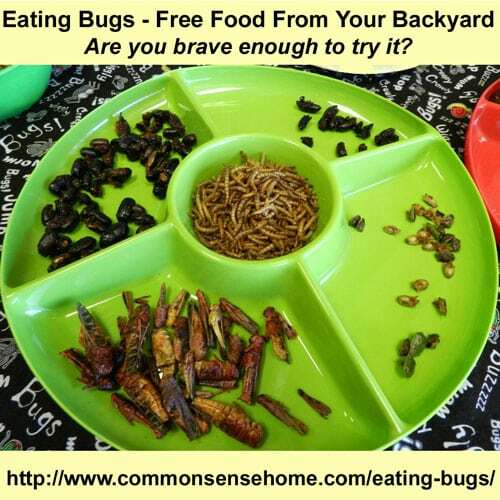 I'm sharing this guest post from Paul Landkamer of Missouri Entomophagy because if you're visiting this site, chances are you've already challenged the status quo and are open-minded enough to get past the initial “ick” factor of eating bugs to the practicality of eating bugs. For those brave souls who never back down from a challenge, read on. Entomophagy (en-toe-MOFF-ah-jee) is a cool word for a cool practice. It comes from “ento” meaning insect, and “phagy” meaning to eat. Thus, Entomophagy = eating bugs. For this article, and when talking entomophagy with just about anyone, we broaden the ento-part to include other critters under the blanket term, “bugs”. As David George Gordon put it in his “Eat-A-Bug Cookbook”, it’s maybe not entomologically (study of insects) correct, but it most certainly is etymologically (study of words) correct to use “bugs” to refer to any little insect, arachnid, terrestrial crustacean, earthworm, slug, or other similar invertebrate. Intentionally eating bugs triggers many responses. I say, “intentionally” because if you eat, you eat bugs or parts of bugs whether or not you want to admit it (there are FDA guidelines for amount of bug parts allowed in foods). Most Americans find the idea of eating bugs revolting. In other countries they are considered delicacies. Insects are surprisingly nutritious, easy to acquire, and fun to eat. Why pass up such a readily-available food source? Most of the world, except the Northwest-European-based cultures, already embrace entomophagy, so we North-Americans could really embrace it, too. The Food and Agriculture Organization of the United Nations released a study in May, 2013, showing how entomophagy might help save the world. See Edible Insects: Future prospects for food and feed security. ? Some activist-entomophagists claim eating bugs will help save Earth’s environment by reducing greenhouse gases, and bug-eating could solve world starvation. I’m not an anthropomorphic-global-warming advocate, and I have reasons to be skeptical of the world hunger claims. Studies have shown that almost half the food produced in the world is wasted, so we should be able to feed everyone. Eating insects can help the environment by helping cut back on pesticide use (just like eating your weeds can help cut herbicide use, but that’s another topic). A drawback to using entomophagy as your pesticide is you usually have to let the bugs do some fair damage to your gardens or lawns before they reach a harvestable size or quantity. Which Bugs are Safe to Eat? When most people talk about entomophagy, they mention chocolate-covered stuff, exotics like emperor scorpions, witchiti grubs, mopane worms or Thai waterbugs. You’ll hear of scorpions and crickets embedded in candy suckers or tiny bags of spiced dried crickets or mealworms. These are fine to eat, but expensive, heavy on packaging, and shipped from around the world. We’ve got a wealth of edible bugs all around us, free for picking. The biggest obstacle to our exploiting them as a food source is the lack of documentation on those familiar backyard critters. How does one decide what’s edible and what’s not? Don’t just eat a handful of collected bugs because you’ve heard you can eat them. There are lots of reasons to be informed before diving into entomophagy. Like with poison ivy and “leaflets three let it be”, it’s not true in every instance. If we left leaflets three alone, we’d never know about strawberries or raspberries or beans. If we wolfed down green black or brown, we might just go into a coma over a black blister beetle or our throats could swell up to the point of suffocation due to the stinging spines on a green and brown saddleback caterpillar. The best way to find what bugs are safe to eat and what ones might be unsafe is to study. Read accounts on-line, in books and talk to people who have experience. Then there are lots of on-line resources and people to tap on. Feel free to contact me, too. I love talking about bug-eating. That, already, gives you lots of bugs to collect, but I’ll get a little more specific and add crane flies, tomato and tobacco hornworms, Carolina and Chinese mantids, stick bugs, squash bugs, box elder bugs, mealworms, lots of scorpions, wasp and bee larvae and pupae, many ants, hover fly larvae, pill bugs (roly-polys, wood lice), many slugs, snails, earthworms and lots more. Although scientific names are preferred, I’m using common names here, so I can get this finished in a timely manner. Be sure of what you’re getting. Note: You'll see the word “toxic” used quite a bit in wild edibles books. It sounds scary, but means anything from causing minor skin irritation to painfully-deadly. Toxic doesn’t necessarily mean it’ll kill you. How Do You Catch Bugs for Eating, and How Do You Cook Bugs? To get you started, we’ll go over some easy-to-acquire pesky bugs like June bugs, stink bugs, tomato worms and grasshoppers. Stink bugs (shield bugs or Pentatomoidea) can be easily collected in the winter when they take shelter in homes or under leaf litter in the woods. Of course, you can collect them off your garden plants while they’re in-season. The only ones, and rather plentiful, with which I’ve got experience are green and brown shield bugs and squash bugs. I’m assuming, and haven’t heard any reasons to suspect otherwise, that marmorated stink bugs would be edible, too. June bugs, or just about any in the Phyllophaga genus, are easy to collect on warm spring or early summer nights. Simply turn on a light at night and wait. I got a bit creative and made a reflector funnel trap. Other Phyllophaga, like Japanese beetles, can be collected while they cluster on and munch foliage by holding a funnel trap (made by cutting the top off a 2-liter soda bottle and inverting it into the base) beneath a cluster and tap them into it. Tomato and tobacco hornworms are well known to any gardener. They’re easy to collect off tomato and pepper plants. The hard part in getting a harvestable batch of hornworms is letting them get big enough, seeing that they’ve gotta eat foliage off plants you probably didn’t plant for their pleasure. Grasshoppers (also include katydids and crickets) are the classic edible bug. They’re featured in the Bible as eaten by John the Baptist, and most people think of fried or chocolate-covered grasshoppers when they consider eating bugs. Grasshoppers are most easily collected on cool nights in the late summer or fall. Otherwise you can play spot-and-pounce, which could be a source of significant exercise. My favorite method of preparation is to boil for 15 minutes, then marinate in a favorite sauce overnight. 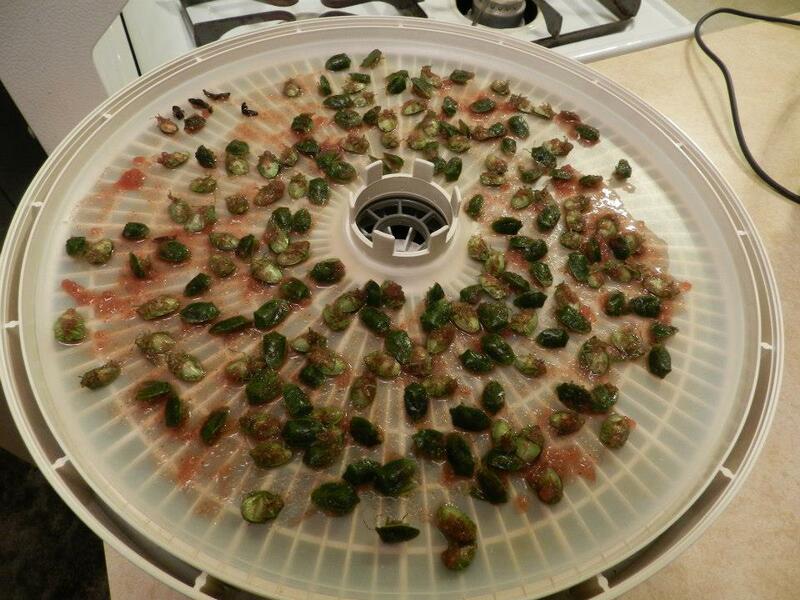 After the marinating, dehydrate them to a crispy crunch. A dehydrator tray full of stink bugs in cranberry marinade. Hornworms are a bit juicy to cook this way. After the pre-boiling, add them to most any soup or stew recipe. Or skip the boiling and throw them into a stir fry until they significantly turn color. If you’re not the creative-cooking type, there are some great insect cookbooks like The Eat-A-Bug Cookbook and Entertaining With Insects, or even how-videos on-line like Daniella Martin’s www.girlmeetsbug.com. Once you’ve fixed the bugs for eating, the best part is sharing them! Enjoy! 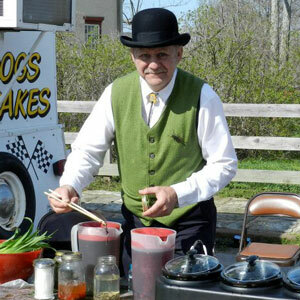 Paul serving up wild edibles at a local event. Feel free to pester me for more information via e-mail (ognyen at yahoo dot com) or through Facebook groups, Missouri Entomophagy or Wild Edibles of Missouri. I know the logic behind eating them but I can’t even pick them up! Yup, bug-a-phobe. Some more than others but there is no way (at this stage or in the forseeable future) that I could consciously pick up and eat an insect. No matter how flavoursome the coating or marinade is. We are so far removed from our food these days here in Australia. Our food system isn’t as industrialised as America but it’s fast headed that way. We’re working towards some level of self sufficiency in our family but the best I could go for unusual edibles is the frogs int he creek beside the house if we had to and wild foraged plants. In the mean time I struggle enough with home harvested chickens. Yes, it’s taking me a while to talk myself into it, too. I’m going to start with freeze dried mealworms in rice krispy treats. Paul says he uses roughly have rice krispies and half meal worms. I bought the rice krispies and marshmallows, now I just need to hit the pet food section and get the worms. I’ll post when I take the plunge. Good luck1 If you’re really interested in bug eating, I’d suggest checking out the Missouri Entomophagy page. Lots of good info, and you may just find a bug eater near you. Yep, they are pretty creepy to look at, it’s true. I hear you. It’s a tough thing to overcome years of ingrained behavior. I’ve made a promise to myself to try eating bugs this summer, just to say I’ve done it, and to know that I could if it really did come down to it. Nothing wrong with being a bug-a-phobe. Lots of people have stuff they’d just rather not deal with. My wife absolutely can’t stand a mouse or rat, yet has no problem with snakes or spiders. Most of the article was written by me, but at least a line was added in the “Why Eat Bugs” section. “Studies have shown that almost half the food produced in the world is wasted, so we should be able to feed everyone.” Enough food is probably produced to feed the world, but those production facilities are not equipped to distribute the food world wide. Although I believe we waste way too much food, particularly in the northern European-based cultures, I have reasons that make me think that waste doesn’t affect the starving parts of the world. Even if we got more frugal with our consumption, the excess wouldn’t be sent to the lesser-developed parts of the world. We’d just reduce production. If we had one central food-production point in the world, that claim might hold true. So, my disclaimer is: I don’t believe our eating insects will really have any significant impact on world hunger, other than make the practice look more acceptable so those lesser developed countries might embrace it openly. Western nations adopting entomophagy won’t help developing countries “embrace it openly”, as most of them already do (some figures claim as much as 80% of the world’s population is normalized to entomophagy). It also won’t help them by providing actual food for the logistical and shipping reasons you outlined. The way it will reduce hunger globally is by streamlining processes and creating modular farming equipment and practices that can be produced at low costs anywhere. Think of it as a clean water filter. Many countries have no access to clean drinking water. Western nations have begun to fabricate small cheap water filters that can be used anywhere, allowing these communities to have access to clean drinking water where before they had no means to filter. If western nations can apply their technology, craftsmanship, and industrial production to creating the means to grow insects on a large scale with minimal investment and infrastructure, we can then teach developing nations to adopt these practices, easing malnutrition anywhere in the world. One thing not mentioned in the article in the “catching and cooking” section is the danger of pesticides, herbicides, and other toxic chemicals in wild-caught bugs. If you trap them in your yard, you have no way of knowing what they’ve been eating, and what chemicals were on their food. If you freeze them right away, all of those chemicals are still inside the insect. If you catch wild insects, please cage them and feed them for 2-3 days on organic vegetable and fruit rinds, bran, oats, or grains. This allows them to purge anything already in the stomachs, and will decrease the chance of consuming harmful chemicals. That being said, you still run the risk of ingesting poisons. If insect growing is done on an industrial scale, we can minimize this risk by setting standards for hygienic growing environments and limits on what types of foods can be fed to the insects (organic feed only). This is what we’re trying to do in Austin Texas, working with local and state government to set the standards for what constitutes a “human consumption grade” insect. One caveat about slugs and snails: they often harbour a dangerous bacteria that can cause spinal meninigitis so it’s very important that they be thoroughly cooked (and best to feed them for a few days on flour or organic matter, as mentioned above, before killing). We don’t have them here, but from what I’ve read they are indeed safe to eat. Be patient. 🙂 My first harvest of them was in suburban Minneapolis. I am looking for some good, non fried, non dairy wood louse recipes. Do you have any ideas or a hint on which recipes can use woodlice instead of crickets, or something? Thank you! I don’t have recipes for woodlice/pill bugs/roly-polies –isopods since I’d not figured out how to catch them cleanly in bulk. I don’t want to take lots of time to sort out the dirt and particulate matter. BUT, they’re supposed to be quite shrimp-like. Our kitchen has bugs, I think maybe flour beetles or saw tooth grain beetles. I cooked a chili last night in the crock pot and there’s on, dead, at the edge. I’m not sure if others got into the food or not. Would it be safe to eat? Probably weevils, which should be edible, just a little more protein. Thanks. I generally don’t eat bugs. I had a cicada once. They go nuts in DC every 17 (I think 17) years. I guy I worked with tried recipes he found in the paper and he brought in chocolate covered cicadas for us to try at work. There’s an “ick” factor with bugs that’s tough to get past at times, but once you get past that, protein is protein. I tried Chapul cricket bars when they first came out (they sent me a free sample to review), and they tasted quite similar to other protein bars on the market. If you didn’t know it was cricket, you probably wouldn’t guess immediately. Can we eat Asian beetles, the ones that look like lady bugs? If so what is the best way and where can I find documentation? My expert friends have never given me a good answer on that one. “Toxic” could even mean tastes bad. I wish I’d have known that when I was a kid. I could’ve told my mom the liver is toxic. I haven’t tried ’em yet.